Dandelion Catering has been established for over twenty years. Our passion for good food and exceptional events has never faltered, but our experience and expertise has grown. Nicky Bidwell, director of catering and head chef, and Paul Winchester, director of events, head the core team. Nicky has an appetite for delicious food, and enjoys everything about it, from sourcing ingredients to creating the perfect meal. Although self-taught, Nicky has travelled across the world with her cooking, from yachts in the south of France to setting up a restaurant in India. She prides herself on her culinary presentation and the great service of Dandelion. Paul is a foodie, great cook and wine buff. His great detail of care in everything hospitality is present in all of his work. Paul knows what makes a party work and makes sure that the hosts relax and enjoy the event. He loves events as his organisational skills, calm manner, and flexibility allows him to deal with the constantly evolving nature of them. Dandelion is the perfect catering and event solution for all occasions. 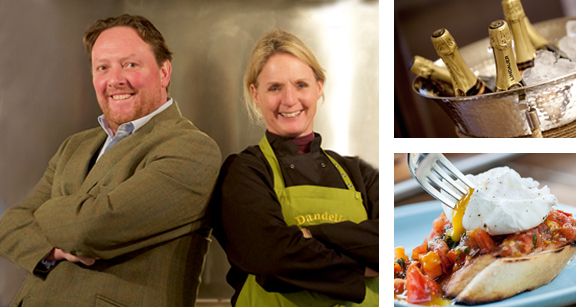 Dandelion Catering provides outstanding food for all events. Our previous experience includes wedding receptions, formal and informal parties, dinners, banquets, corporate events, cocktail parties, soirees and shooting parties. Dandelion Events are professional event and party planners, working alongside Dandelion Catering, to create events spanning across Suffolk, Cambridgeshire, Norfolk, Essex and London.